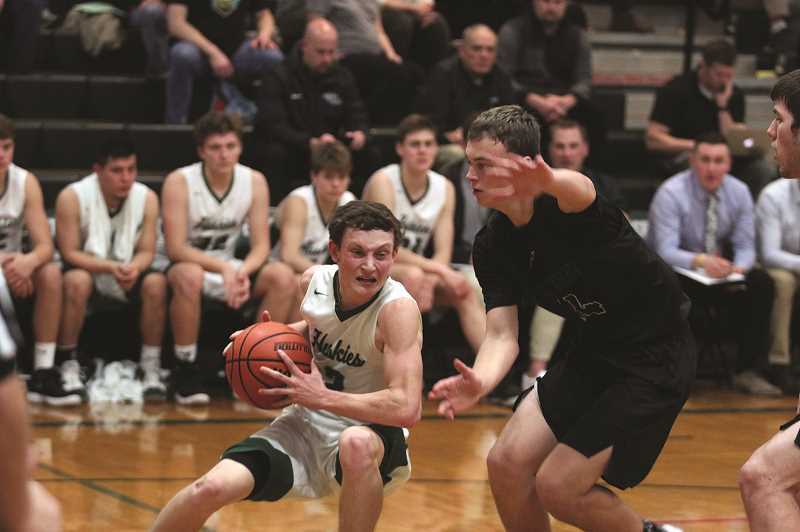 The North Marion boys basketball team felt the stinging blow of a renewed rivalry game on Friday when the Huskies traveled to Gladstone High School. The game was clash of unbeaten teams in the Tri-Valley Conference eager to get an early lead in the league standings. The No. 7 Gladiators (13-5, 4-0 Tri-Valley) picked up their fifth consecutive win and eighth in their past nine games with the 67-52 victory over the Huskies (9-9, 3-1), who in turn had their season-best three-game win streak snapped. For the two teams, it's only the most recent clash in a long-running rivalry that dates back more than a decade. "Both teams play hard," North Marion head coach Tully Wagner said. "(Gladstone Head Coach) Cody (Aker) does a really good job coaching over there. It's always an enjoyable matchup for many aspects." When the OSAA bumped up to six classifications in 2006, the North Marion Huskies and Gladstone Gladiators became instant rivals. Gladstone joined the Huskies in the former Capital Conference after the initial redistricting, and the two followed each other to the Tri-Valley Conference in 2010. When North Marion was sent to the Oregon West Conference four years later, the rivalry persisted. The Gladiators twice beat the Huskies by single digits in non-conference tournament games in the 2014-15 season en route to a 20-win season and the Tri-Valley Championship. But North Marion got the final word in the playoffs, finishing third in the Oregon West and traveling to Gladstone in the first round. The Huskies pulled off an upset victory over the Gladiators and marched their way to the state championship game where they went on to lose to Scappoose. The following year, Gladstone repaid the rivalry debt, knocking out the fourth-ranked Huskies at home in the first round of the state playoffs. 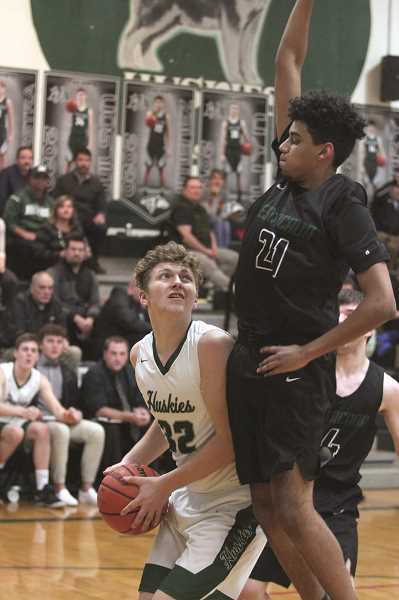 While the two programs failed to meet up in the regular season or playoffs in each of the past two years, now that the Huskies are once again back in the Tri-Valley Conference, the teams guaranteed to meet at least twice a season. "Gladstone/North Marion is always a good game," Wagner said. "They're really good, but we're really good as well." The loss on Friday was a tough blow for a North Marion team that had been playing some of its best basketball of the season to open 2019. North Marion opened the year against the three highest ranked teams in the state — Marshfield, Banks and Seaside — and played competitively in two of three, losing at the buzzer in two of three. "We knew we were starting to play better toward the second half of our non-league schedule. It just so happened that we were playing the best teams in the state," Wagner said. "We unfortunately lost two of those games by a point, but we knew we were playing a lot better, especially defensively. That defense proved to be on point through the first three games of the league schedule. The Huskies beat Molalla 68-44 on Jan. 16, and ran away with a 90-54 win over Madras on Jan. 18. 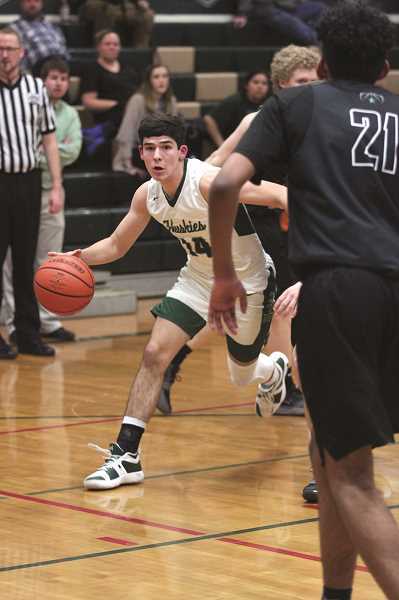 But the team's 66-38 victory over the Estacada Rangers on Jan. 22 was the Huskies' best defensive effort of the season and showed what the team could do when it was competing at its highest level. The Rangers started strong, going on a 7-2 run to open the game, but from there the game belonged to North Marion. The Huskies went on a 29-9 run over the remainder of the half to take a 31-16 lead going into the locker room. "Anytime you can take a 16-point half, you're going to take it," Wagner said. "Then I thought we really continued doing that, especially into the third quarter and were able to do that defensively." The second half was much the same, with the Huskies using its defense to create turnovers that led to fast break buckets, spreading the offense around liberally. Junior Sergio Jimenez led the team with 20 points, while senior Brady Hansen added 12, nine of which came in the final period. Grant Henry and Jared Hauser each added 11 in the win. "We're definitely at our best when we have multiple people scoring, so that's good," Wagner said. The Huskies will seek to keep up with the Gladiators this week when they host the first of three consecutive home games. North Marion was scheduled to play Corbett (8-9, 2-2) on Tuesday, followed by Molalla (1-15, 0-4) on Friday.